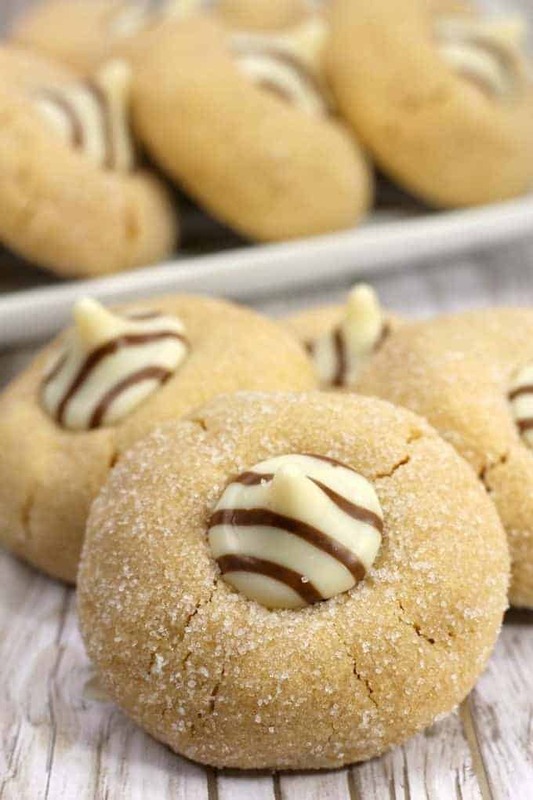 Soft and chewy, these Peanut Butter Blossom Cookies (aka Hershey Kiss Cookies) are the perfect treat to satisfy your chocolate peanut butter fix! Start with a delicious peanut butter cookie, roll it in sugar, then add on either a Hershey’s Chocolate Kiss or shake it up with a Hershey’s Hug. Either way, this classic blossom cookie will steal the show! 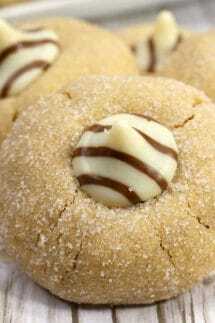 I challenge you to find a bake sale or Christmas cookie exchange that doesn’t have Peanut Butter Blossoms included in it. Why, you may ask? 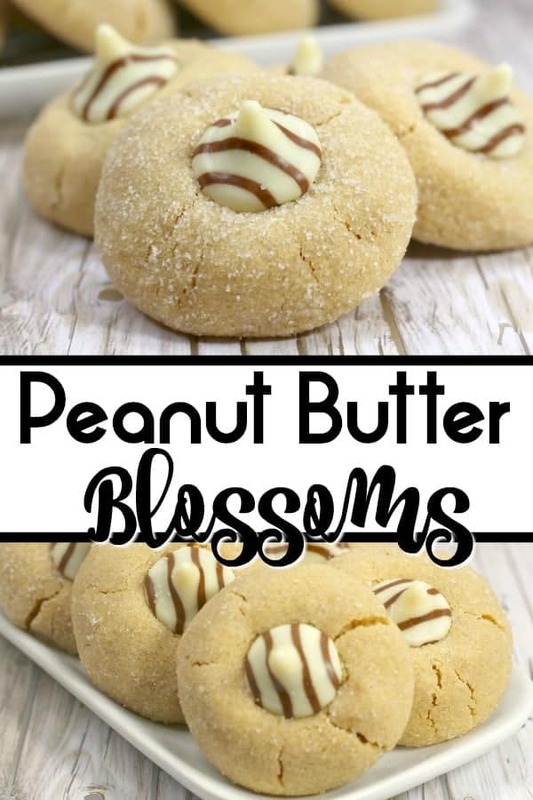 What is the fascination with Peanut Butter Blossom cookies? Personally, they remind me of my childhood. My grandma used to make them all the time. While she made tons of different types of homemade cookies, these were always among the favorites! There is nothing better than biting into a soft peanut butter cookie, crunching on those tiny grains of sugar coated on the cookie and then, the piece de resistance…. the Hershey Kiss in the center! There is nothing better than that chocolate peanut butter combination! 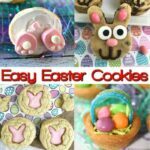 I loved to make these cookies with my kids when they were younger, they used to love to press the Hershey Kiss into the soft cookies! Now they don’t want to do the work, they just want the treats to appear before them! In this peanut butter cookie, I call to use shortening. But honestly, butter can easily be swapped out. In general, you can substitute butter and shortening in equal amounts. Shortening will give a chewier taste and cookies made with butter will be a bit crispier and will have more of a richer flavor! If you bake even a little bit, you probably have most of the ingredients already in your pantry! Follow the recipe below to mix the ingredients together. Once everything is combined, scoop the dough and roll it into a ball. Roll the ball into the sugar to coat the outside of the ball and place on a baking sheet. Bake the cookies for 11 minutes. Take them out and let them cool for 2 minutes. Then place a Hershey Kiss or Hershey Hug gently in the center of the cookie. Let cool before serving. Try these variations for your Blossom Cookies! Want to shake things up? Try topping your peanut butter cookies with these delicious toppings! 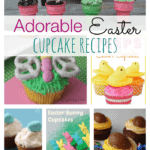 Any flavor Hershey Kiss – Personally, I want to try the caramel, almond and cherry cordial! I’m sure my children will be delighted with these cookies. I love how easy and delicious this is! Good idea! Looks very tasty! awwwww thank you so much for your comment!